Serta's Perfect Start Deluxe Crib & Toddler Mattress accommodates your growing baby through their infant and toddler stages. 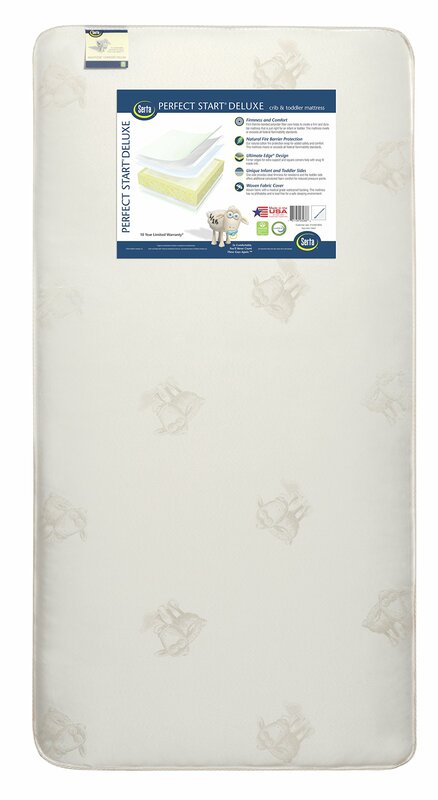 Built to fit both standard size cribs and toddler beds, its unique infant and toddler sides provide the ideal construction for each phase-firmness for infant's on one side, and convoluted foam comfort on the toddler side to help reduce pressure points. At the core of this mattress, a firm thermo-bonded polyester fiber will provide constant support. Finished with Serta's Ultimate Edge, the Perfect Start Deluxe Crib & Toddler Mattress features firm edges that help create a secure fit inside the crib. Designed by the same brand that's been leading the way in mattress innovation and technology for more than 80 years, Serta's crib and toddler mattresses deliver the same quality craftsmanship and attention to detail as their adult mattresses. All Serta crib mattresses are GREENGUARD Gold Certified and meet the strictest standards offered by the GREENGUARD Environmental Institute, which recognizes products with low chemical emissions, contributing to improved indoor air quality. Limited 10 year warranty Dimensions 52" x 27.5" < 6"